Epic/Legacy Recordings in collaboration with the Estate of Michael Jackson today announced the highly anticipated track listing for the September 18th release of Michael Jackson BAD25 that celebrates the legendary album and record breaking BAD tour. Featured in the deluxe package, are three CDs, two collectible booklets, and the first ever authorized DVD release of a concert from the record breaking BAD World Tour – the July 16, 1988 sold out Wembley Stadium show in London. CD one features re-mastered versions of Michael’s biggest hits on the original BAD album, including, “Smooth Criminal,” “Man In The Mirror,” “Bad,” “Another Part of Me,” “The Way You Make Me Feel,” and “Dirty Diana” arranged in the same sequence as they appeared on the original album released 25 years ago. “Leave Me Alone” was added to the album as a bonus track following its initial release and has been included on the disc. CD two offers fans a rare listen to thirteen additional tracks, 6 of which are previously unreleased demo recordings created at Michael’s personal studio built at his then-home on Hayvenhurst Avenue in Encino, California. Also included are all three bonus tracks from the 2001 expanded edition of BAD, the previously un-released French version of Michael performing the classic, “I Just Can’t Stop Loving You,” a high power version of “Speed Demon” remixed by Nero and the brand new remix of “Bad” worked on as an electrifying collaboration between Pitbull and Dutch DJ Afrojack. Recordings included in this package reflect the songs and spirit of Michael Jackson’s artistry during BAD’s recording sessions and have been selected to show the different stages of how Michael’s songwriting and recording genius took shape. Some tracks are so complete that any other artist but Michael Jackson – who worked tirelessly to make sure his songs reflected his vision – might consider them finished tracks. Others are less complete but offer insight into Michael’s creative process in its various stages. Included is the demo, “Al Capone,” an early incarnation of what ultimately became “Smooth Criminal,” “Don’t Be Messin’ Around,” an example of a more complete demo, and a song initially titled, “Song Groove.” That song later became known as “Abortion Papers” which according to Michael’s own records, he spent considerable time in weighing how best to thoughtfully address something that was, and remains, a very personal and sensitive issue. 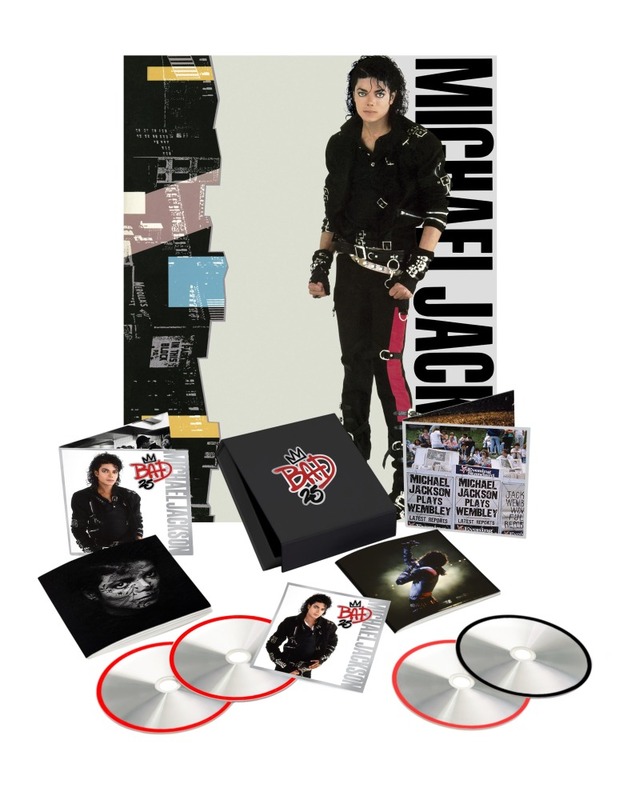 A true highlight of the package is CD three and the DVD – the never seen before live concert on DVD and its accompanying music CD of Michael’s legendary July 16, 1988 concert at Wembley Stadium. The concert is not a compilation of performances, but rather one complete show, exactly as Michael performed it for Prince Charles, Princess Diana and the 72,000 fans who were in the audience for that night’s sold out show. This show was one of the seven record-breaking nights played at the venue attended by more than half a million people – three times that many people tried to purchase tickets. The DVD was sourced from Michael Jackson’s personal VHS copy of the performance as shown on the JumboTrons during the concert. This footage was only recently unearthed and is the only known copy of the show to exist. The visuals have now been restored and the audio quality enhanced so that fans can share in the excitement of that famous night in 5.1 surround sound taken from the original multitrack recordings made that night. In addition to the complete Wembley Show, the DVD will also contain “The Way You Make Me Feel” from Michael’s July 15th performance at Wembley Stadium. This is the only song not performed on July 16thdue to the late start of that night’s show. Also included are the thrilling early performances of “I Just Can’t Stop Loving You” and “Bad” from the Yokohama Stadium performance in September of 1987 during the first leg of the BAD World Tour. You can pre-order the set below thru Amazon. Or you can order the MJ exclusive packaging set thru the website by CLICKING HERE! This entry was posted on Tuesday, August 7th, 2012 at 9:53 am	and is filed under Film, Music, News. You can follow any responses to this entry through the RSS 2.0 feed. You can skip to the end and leave a response. Pinging is currently not allowed. « Tom Waits Delivers New Music Video! No Tour Announcement!